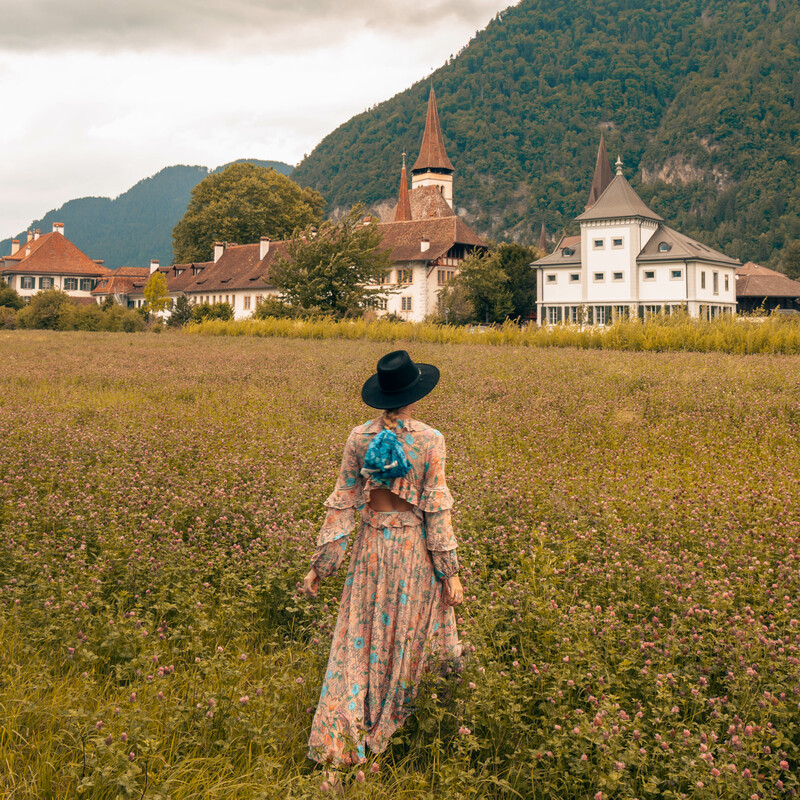 Switzerland has so many lakes, mountains, fields, hikes etc that choosing where we wanted to visit and compiling this list wasn’t easy, however here is my guide to our favourite places to visit in Switzerland in the summer. Interlaken is a town nestled between two lakes – Brienzersee and Thuner See – in the middle of Switzerland. You can take cable cars and small trains (called a funicular) to various view points around the lakes, with the most popular being the Harder Kulm view point that is close to the Interlaken Ost railway station. You can stand out on the “Two Lakes Bridge” and admire the turquoise waters of both Lake Brienz to the right and Lake Thun to the left. From the Harder Kulm view point, you can hike the Hardergrat trail – an incredibly sketchy, 8-10 hour long, 16 mile hike across the ridge line alongside Lake Brienz – and find yourself above the clouds over 5,000 feet above the level of the lake. This hike is pretty extreme, with sheer drops on either side of the trail and steep ups and downs to navigate. Once at the end of the ridge line, there is another funicular train to take you back down the mountain. The last train leaves at 6:30pm so plan enough time to get there as the hike down is long and steep if you miss the train. If you’ve read my blog post about hiking Angel’s Landing in Zion National Park you’ll know how scared I am of heights and this hike was much, much worse. Disclaimer: you should never attempt this hike in the wet or high winds as it really will be too dangerous. If the hikes here aren’t thrilling enough, there are other extreme sports such as sky diving, paragliding and hang gliding which should satisfy even the toughest dare-devils. Interlaken is pretty pricy, even by Swiss standards, so you might not want to spend too long there unless you’re willing to spend some serious cash. A 20 minute drive from Interlaken, this place is not to be missed. Lauterbrunnen is a small village nestled between two sheer rock faces with waterfalls pouring down into the river which runs through the village. The quaint streets are lined with cafes, and traditional Swiss chalet style hotels and there is a small church at the centre. The Swiss ski resort of Zermatt is the most popular place to stay to visit the iconic Matterhorn mountain on the border of Italy. The mountain is one of the highest in the Alps and is a pyramid jutting out above the surrounding peaks at a height of 4,478 metres. The Matterhorn is known in German as the Mountain of Mountains and is one of the most iconic peaks in Switzerland so it is not one to be missed. The area around the mountain is home to beautiful lakes, hiking trails and cable car routes which means there is something to see for everyone. (Note: when we visited we accidentally booked a hotel on the Italian side of the mountain – as shown in the photo – but this is just as beautiful!) There are also places in the area where you can ski (even in the summer) so it’s worth asking around if this is your cup of tea. Engelberg is a popular tourist resort in both winter and summer and is found just south of the major city of Lucerne. There are many hiking trails for the adventurous tourists and you can also take the cable car to the top of Mount Titlis; a mountain that towers over 3,200 metres above sea level. The town itself is filled with lots of traditional-looking hotels, restaurants and bars to indulge in after a day out on the trails. This tiny village, less than 30 minutes drive from Engelberg, up a steep winding road into the mountains doesn’t seem like a huge tourist destination on first impression, however it is home to a cable car which will take you up a mountain to a beautiful lake called Bannalpsee. The lake is actually a man-made reservoir that was constructed in the 1930s but the clear waters and surrounding mountain peaks attract visitors just like the other lakes in Switzerland. Switzerland is super expensive – especially Interlaken. One of the good things is that many places will let you pay in Euros (some even accepted our British Pounds) so you don’t have to worry about changing lots of money into Swiss Francs if you’re visiting Switzerland from another European country. Make sure that you also carry a small amount of Francs in cash as some places, e.g. the cable cars, don’t take card payments. If you visit Switzerland, don’t forget to grab yourself a traditional cheese fondue: you won’t regret it!